I apologize if this has been posted before, I looked through a few back posts and don't see anything. Lucy is quite gassey and her ummm, farts, can literally clear a room. It is amusing when you can actually hear them because I really want her to get a smirk on her face and have some acknowledgement that she's going to leave a bomb. My boyfriend is wanting me to research if there is a way to make her cut down on the farting. We were thinking maybe it's the food? He wants to give her bean-o, but I'm noth thinking that is a good idea. Anyone have experience with this? Is there something that can be done or is it just a boston quirk that we have to live with? what food are you feeding now? definitely if your dog has food sensitivities, they could react by being gassy. i know giving jim chicken results in some verrrrry bad gas so he doesn't get chicken any more! The Costco dry puppy food. She's not any more gassy so that's good. i would definitely try eliminating chicken from her diet. bostons are known for being stinky fart monsters. unless she's been significantly more gassy than usual recently, i wouldn't really attribute it to much more than that. Their faces are just so flat it makes it hard to eat without swallowing a lot of air, no matter what kind of food you're giving 'em. And all that air they swallow has to come out sooner or later. That would make sense - she gulps down her food too. You might want to get a slow-feeder bowl for Lucy's food if she tends to horf it down. The bowl is shaped so the dog can't gulp the food. I know one is called the Brake-Fast bowl. Most pet stores should carry them. ooh boy - i KNEW that eloise and miss lucy were related! honestly, you would never imagine that such a sweet little delicate girl could possibly make such a STANK. oh and yes, she's totally deadpan about it too! sneaky little monster. Bostons are (unfortunately) known to be one of the gassiest breeds. You can cut down on the gas by avoiding poor quality foods, but you can't prevent it totally. 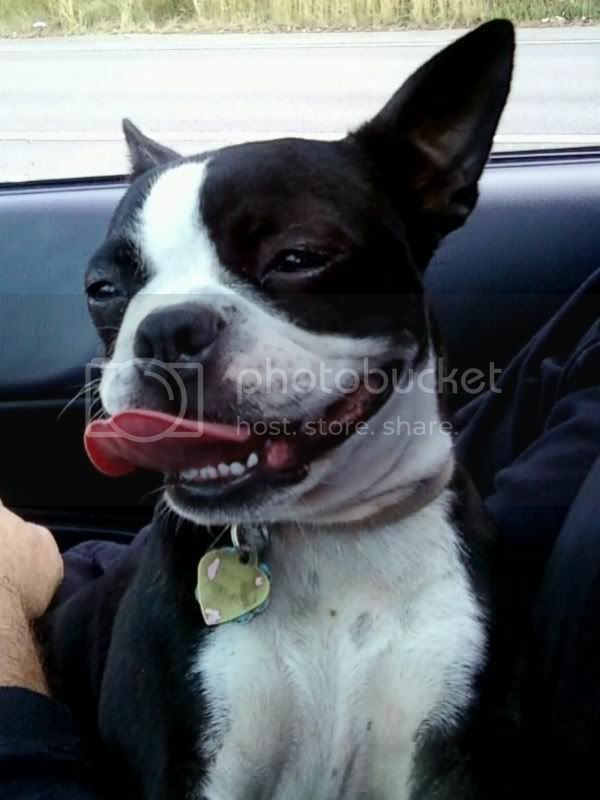 As a previous commenter said, the shape of their faces lead Bostons to inhale a lot of air when then eat which leads to gas. Try giving her food that has lamb as one of the top 3 ingredients. Costco has a Kirkland's dog food that is great! It got an A rating for dog food ingredients. My dog is gassy but rarely smells so I think it is the diet that you should be concerned about. Plus, lamb is great for skin allergies and they like the taste of it!